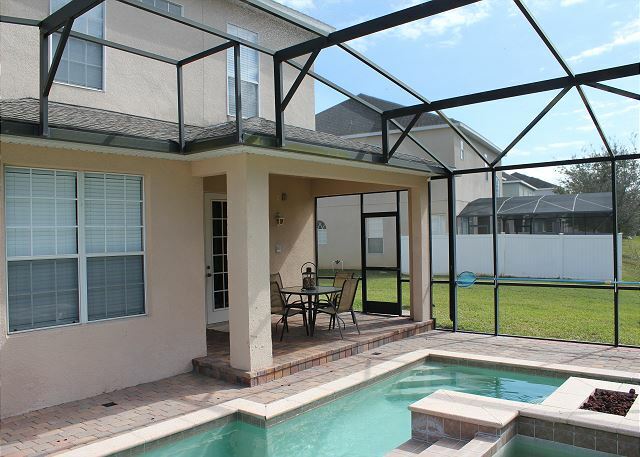 This Excellent Vacation Home is just 15 minutes away from Orlando International Airport and only 40 minutes from Sanford Airport. Situated close to exit number 14 of the SR 417 (Central Florida GreeneWay), it is only minutes to Walt Disney World, Universal Studios and Sea World theme parks. There are supermarkets and dining both formal and informal close by too. Everything you could possibly need is close at hand. A total of 6 flatscreen TV. One 40" screen in each bedroom plus one in the entertainment room upstairs and another one in the family room downstairs. This villa also offers free domestic phone calls (Including Canada and PR) and high speed internet (WiFi). The villa has many extras to make your stay very enjoyable. It has been furnished to a very high standard. The villa is two story - the ground (or first floor) is open plan which keeps it cool and airy. Upstairs there is a loft with a couch and a TV and play station. 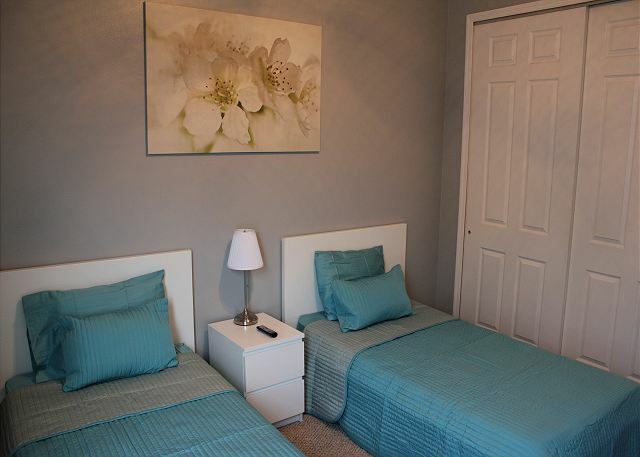 All 4 bedrooms are upstairs as well, one Queen sized bedroom, two bedrooms with two twin beds each and the master bedroom with a King-sized bed. 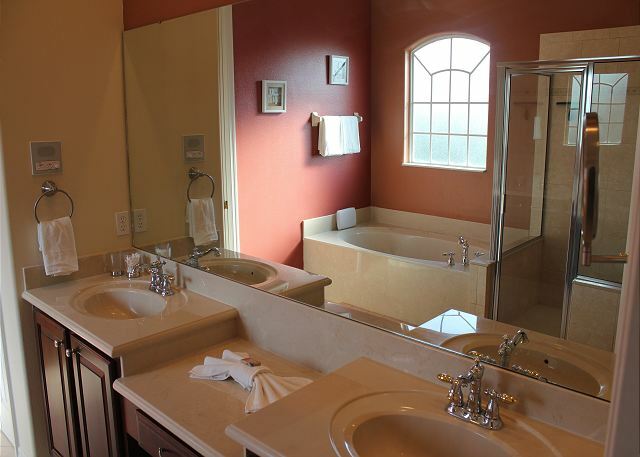 The master has its own en suite bathroom with bath tub, separate shower, separate toilet and double sink. The other bedrooms share a bathroom with bath/shower, toilet and double sink. 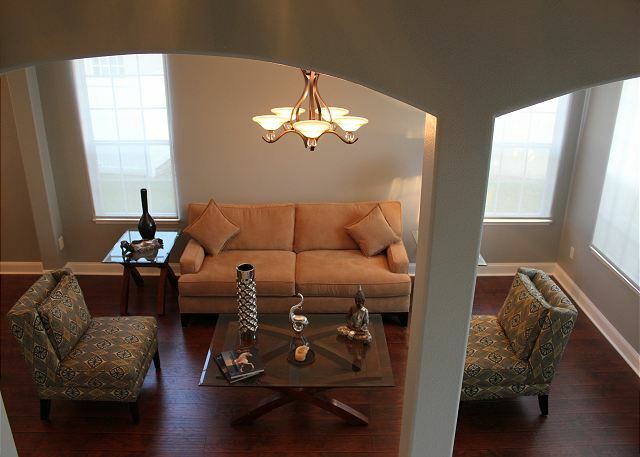 Downstairs you will find a living room, a dining room, a kitchen with breakfast nook and a family room. 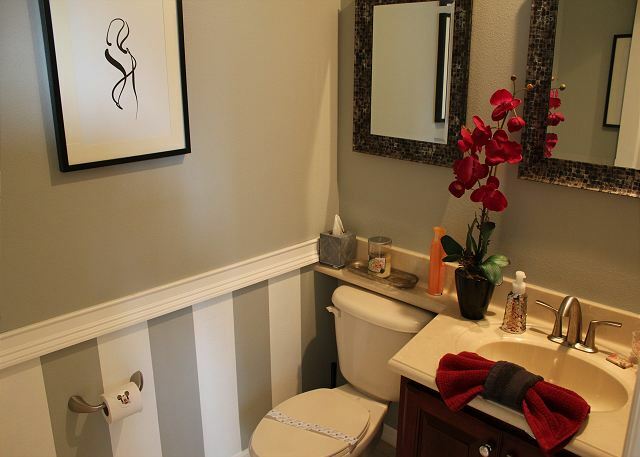 There is also a half bath downstairs, with a toilet and sink. 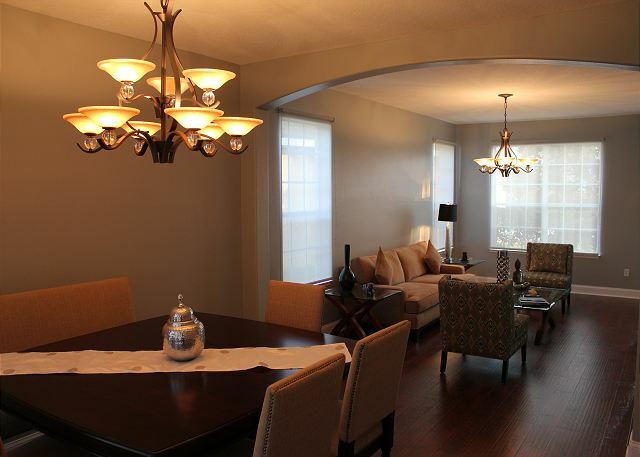 The family room offers access through the french patio doors to the inviting swimming pool. Pool deck chairs allow for pool side dining and relaxing. 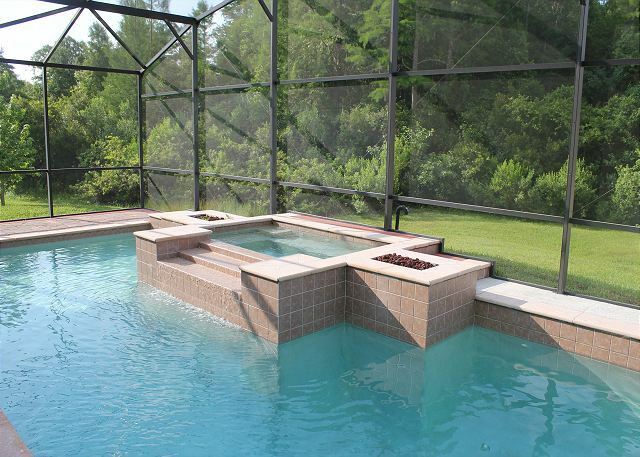 The separate area as seen in the photos is feature only, not a hot tub. Pool heat is not available. As Excellent Vacation Homes is the local management company looking after this property too, 365 days a year, any technical or other issue is usually prevented before it even gets a chance to develop. But, our 24-hour cover service is always available should you require it during your stay. The villa is fully air conditioned for those very hot days and has reverse air for those colder days. The house was lovely and was in an excellent location. Convenient to grocery stores, gas stations, parks, etc. Hi Deloris, thank you for your wonderful review. Glad you and your family enjoyed your stay. We look forward to welcoming you again the next time you visit the Orlando area. Hello George, thank you for your review and feedback. We do take your feedback to heart, so have reviewed on site to see what may have happened. It appears older towels kept separate (stored in garage for later disposal) were placed back in rotation, possibly by a previous guest finding them. There are plenty, good quality towels available so should not have been an issue in the first place. Ceiling fans are controlled through remotes, placed on night stands in each bedroom by the villa inspector, prior to guest arrival. Our apologies if that may not have been the case for your arrival (they may have been in the drawer?). The slow draining sink was addressed shortly after receiving your feedback. We understand that some guests prefer to not report their concerns while in town, but if you would have, we could have helped you with each and every concern, making your stay even more enjoyable. Granted, it should have been up to par upon arrival, but some items are addressed on a regular basis, such as the bugs in the porch, but is doesn't take long for those to return after cleans, especially since we leave the light on for arriving guests' convenience. Again, we greatly appreciate the feedback and the opportunity to explain and correct where needed, and look forward to welcoming you back next time you visit the area. Hello Melissa, thank you for your wonderful review. Happy you enjoyed your stay. We look forward to your next visit to the Orlando area. It was a beautiful neighborhood. The house was very clean. Next time I visit Orlando I will definitely consider booking this property again. Only thing it needs is a pool heater. I recommend this for big families. Hello Jose, thank you for your wonderful review. Glad you and your family enjoyed your stay. Great suggestion, however at this time the home owner has shown no interest yet in investing in a pool heater. Many guests do not require pool use in the winter, so it is not considered an absolute must for all vacation homes. We look forward to welcoming you again the next time you visit the Orlando area. A Great Home to make many memories with the family! Overall very satisfied... would definetly return. 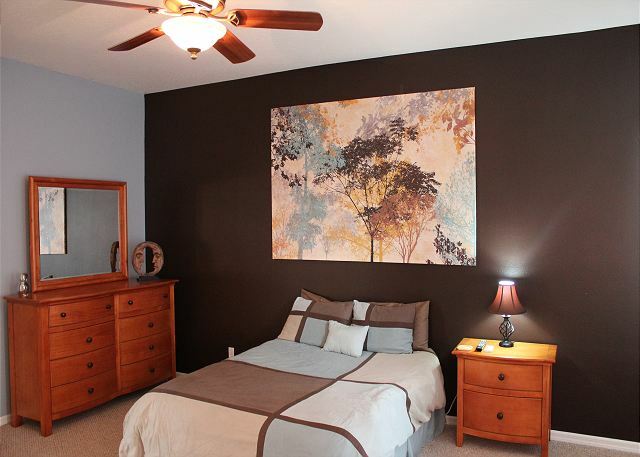 Spacious, Clean and perfect area...close to markets and restaurants. Thank you Amy for a great review. Glad you enjoyed this wonderful home and we look forward to welcoming you again the next time you visit Central Florida! overall this is a beautiful home located in a gated community close to the theme parks, international drive,stores, I-4, ect.The only drawback would be some routine maintenance, there were a couple of minor issues, but in no way would not stop me from returning in the future.only suggestion would be to have lights out by the pool area.the management company was very helpful. Hi Marc, thank you for this wonderful review, we look forward to welcoming you again on your future visit! My family and I enjoyed our stay. The home was absolutely gorgeous. This was my first time using Home Away and I was pleasantly surprised with everything associated with the house. Hi Tameka, thank you for an excellent review score. We are happy to read you enjoyed your stay and we look forward to welcoming you again in the future! This was a great home and my family enjoy the stay. It was close to all of the major stores. Hi Jennifer, thank you for an excellent review. Glad you enjoyed this wonderful vacation home and we look forward to welcoming you again! The mattresses on the bed were hard and the pool needs a heater. The pool was very nice however no heater made it impossible to use the pool. The house was nice and location was good. Hi Kristi, we apologize that you were disappointed by the fact that this pool is not heated. As far as the bed being hard, most of our mattresses are of a medium to hard firmness, simply because the softer ones loose their firmness all together too quickly. Thanks again for staying with us and we look forward to seeing you again. Thank you Gloria for an excellent review score. Glad you enjoyed the house and we look forward to welcoming you again this year!! Location to theme parks was fine. The overall cleanliness was adequate, however, the carpeting is showing wear and stained. Kitchen needs additional silverware and new pots and pans. Hello Lawrence, thank you for your review. Happy you enjoyed your stay. We have had the carpets cleaned following your feedback, and as of mid December the owner has also replaced several pots and pans and added silverware. Thank you again, and we look forward to your next visit to the Orlando area. We were very please and pleasantly surprised with your rental home. It was a beautiful large home close to everything. We felt safe in the gated community and enjoyed the pool. 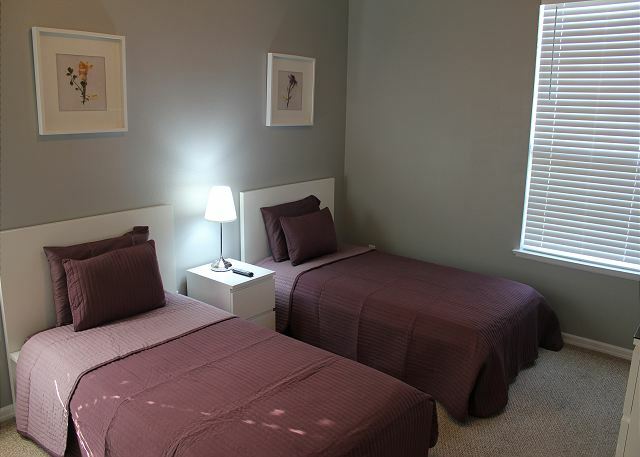 As mentioned in most reviews, although I wasn't to concerned, the beds truly need to be updated. They are either very old or poorly made. This comment is for all beds. Our anxiety was heightened by the instructions of entering the home and turning off the alarm, but we found the alarm wasn't even left on. The faucets in the children's bathroom were loose and had no running hot water. I do not recommend using the oven as it hasn't been cleaned and came be a fire hazard. There were plenty of towels provided but no wash clothes. During our last day the alarm wall control unit started to beep throwing a code that was not on the information panel. I called the lister with no response and then call the alarm company. The informed me that there was so service monitoring the home. They did however help us quiet the control panel for a few hours but it continued all night. Please don't misunderstand our review. 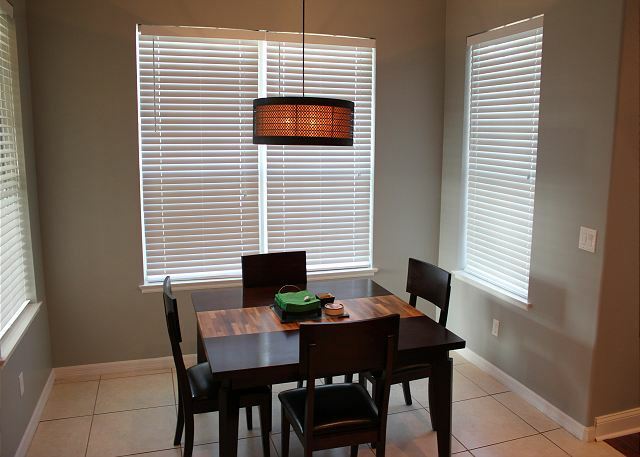 It's a beautiful, spacious, well equipped home that is affordable for family's to visit Orlando. It does need better care and maintenance. A great way to enjoy your family, in the hours you are not at the parks. A definite high note was returning to the house in the evening to relax and share the days experiences. The kids loved the freedom to play and bond with family. Hi Greg, thank you for this great review. Glad you enjoyed your stay at this Excellent Vacation Home! Please come back and see us next time you visit the area. We enjoyed our stay but many details were over looked on the property. The two master bedrooms had horrible beds that have been due to be replaced for a while based on other reviews I have seen. Our pool was green for the first half of our visit. We purchased products from the pool store nearby to fix the problem because they didn't come after we called. Many lifts were burned out but when we contacted them they came the next day. The dishwasher was broken, my boyfriend fixed that too. Some of the pans still had good curated on them, the bath tub in the guest bathroom had a layer of brown dirt and scrum, and the taps in the same bathroom had a layer of white residue. The windows were dirty and haven't been cleaned in a while. Although this property needed a good thourough cleaning I would still recommend it. The cleaners just need to do a better job cleaning and they need to replace the beds. 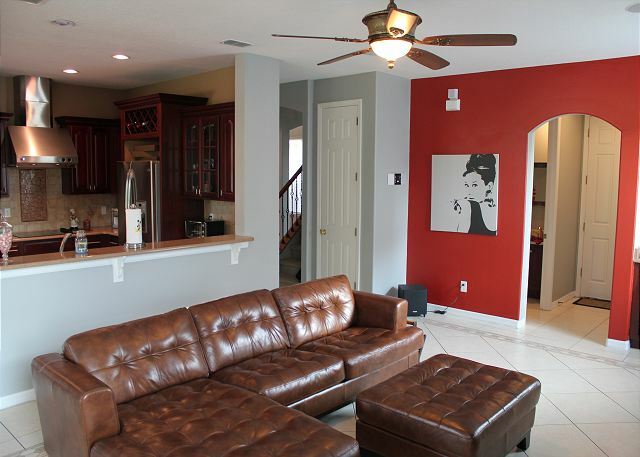 This was the third time I have rented a house in the Orlando area and this house was by far the nicest. The appliances, bathrooms, furniture, and bed quality were top notch. The layout of this house is perfect and extremely roomy. Also, the bedrooms are huge. Dear Corey, thank you for an excellent review. Glad you enjoyed your stay at this Excellent Vacation Home! Please come back and see us next time you visit the area. Hi Anders, thank you for a great review. 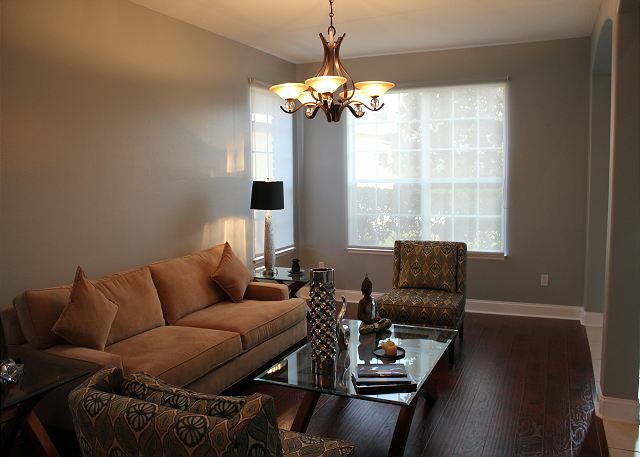 We are happy you enjoyed this home & look forward to welcoming you again in the future. We were very pleased when we pulled up to the house! Very nice outside. And beautiful inside on the mail floor! However the pool could not be used apparently is only for looks , and the beds upstairs were HORRIBLE ??. Honestly if they would invest in new beds and some dressers in the bedrooms it would be a wonderful vacation home. Hi Tim, thank you for your review and feedback. This pool does not have a pool heater. We understand mattresses are very personal where it comes to preference for a degree of firmness. Most of our mattresses are of a medium to hard firmness, simply because the softer ones loose their firmness all together too quickly. Thanks again for staying with us and we look forward to seeing you again. The house was lovely, great location, spotless. The only negative comment I have is the "sparse" or lack of furnituRe in the master bedroom and both queen beds in the master and second bedroom truly need replacing. Both beds are on their last leg. The second bedroom needs,a new mates and the master should have a king size bed. I brought the observation to the manager and he was wonderful explaining that the bed was broken and was held up on bricks and they were waiting for parts...that bed needs to go :) but other than that, I would gladly stay at 2609 Sand Circle again! Dear Varinnia, thank you for a great review and your feedback. We are glad you enjoyed your stay and look forward to welcoming you again in the future! Loved the house, so clean and spacious. The kids were in the pool at all times. We'll definitely stay here the next time we're going to Disney World. Thank you Becca for an excellent review score. Glad you enjoyed this wonderful vacation home and we look forward to welcoming you again in the future! The location of this house is perfect! We did 4 parks in 4 days and had zero trouble with getting around. Also close enough to downtown events and an hour from Daytona beach. Check your rental car notes about tolls. We had a daily fee of 4.00 if we used the easy pass. Tolls were daily under 2.00, so wish I would have stopped and paid. After 7 days it added up. The house has plenty of room, and the pool was especially perfect after a hot day. Dear Elizabeth, thank you for a great review. Glad you enjoyed your stay at this Excellent Vacation Home! Please come back and see us next time you visit the area. Dear Cheryl, thank you for a great review & feedback. We are in the process to replace the bed in the master bedroom. Thanks again for your stay and we look forward to welcoming you again in the future. This was the perfect house for the 6 of us. Dear Patrick, thank you for an excellent review score. We are happy to read you enjoyed your stay and we look forward to welcoming you again in the future!! Holiday rental (Sandarborough Retreat) in Orlando, FL in October 2017 for 11 nights. • We had a good stay overall and felt comfortable? • the apartment was in our best position? • the house clean and in good condition? Water outlet at washing machine, gasket? Alarm system was out of order. • the staff on the phone helpful? We did not reply to our mail from 12.10. by requesting a holiday apartment. We will be back at any time! The house and it’s furnishings/amenities are beautiful. We live in Georgia and visit Orlando fairly often and this house was by far the nicest we have stayed in. We will be back! Hi Jaime, thank you very much for this great review. Glad you and your family enjoyed your stay at this Excellent Vacation Home! Please come back and see us next time you visit the area. 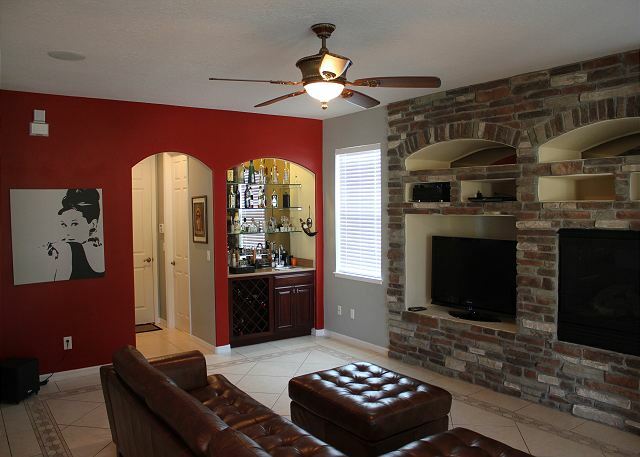 This property was perfect for going to Disney and Universal both about a half hour away. The beach was an hour away. We also went to Wild Florida (about 25 minutes away) which was amazing alligator farm and air boat ride company. They had a whole bunch of really cool animals. I would highly recommend going there. It was free to get in and see all of the animals (not sure if it's always free). Anyway, the home was great for our needs. We have five daughters and they loved the pool. The master bed was really comfortable. A few things that could have been better at the home: The queen bed was terrible. It was sunken in in the middle. It really needs to be replaced. The light/fan in the master didn't work. The home always felt a little bit hot. They say you can't set the thermostat below 75 or the unit will freeze. Sounds to me like they need a new unit. We really needed more dishes. If you stay here you will need to buy paper plates and spoons. All in all though, I would recommend this house because of the location and the pool. Hi Cindy, thank you for a great review and your feedback. A quick call to the office and we could have taken care of the light/fan in the master (turned out it is working fine, so connection between wall switch and fan's remote may have been missed?) and other concerns. Glad you enjoyed this wonderful vacation home and we look forward to welcoming you again in the future!! Everything was great, except for the heat in the pool and specifically the hot tub. The gal I called said, "the listing doesn't say the heater is functional".....Showing off a pool & spa and not saying "heater doesn't work" is like showing a picture of TV's in the house and they don't work. You have to say in the listing the heater does not work! One of the only reasons we chose this house over other options was that it had a nice pool & hot tub that we assumed worked. Other than that, great house, nicely appointed. We apologize that you were disappointed by the fact that this pool is not heated and that the separate area is not a hot tub. We have always been open and honest in our listing about this: "The separate area as seen in the photos is feature only, not a hot tub. Pool heat is not available". Thank you for giving us a 5-star review for our services, the cleanliness, the location and the property condition. 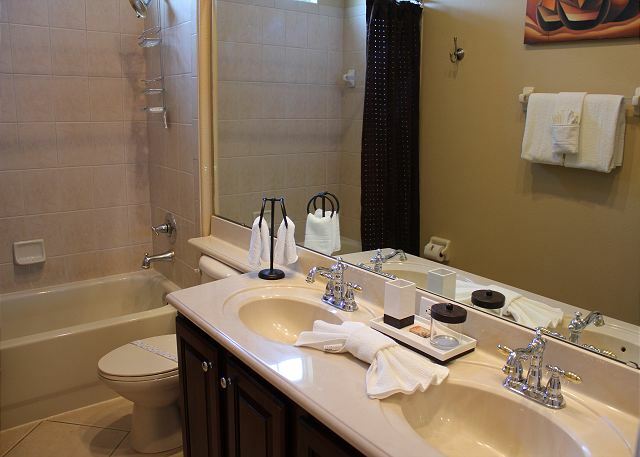 We look forward to your next visit in one of our many homes with a heated pool and/or spa. Took 6 year old and 6 month old on Orlando vacation! Great accommodations! Close to all the parks. Hi Lynette, thank you for an excellent review! Glad you & your family enjoyed your stay at this great home and we look forward to welcoming you again in the future! Great location and house for USTA or Disney! 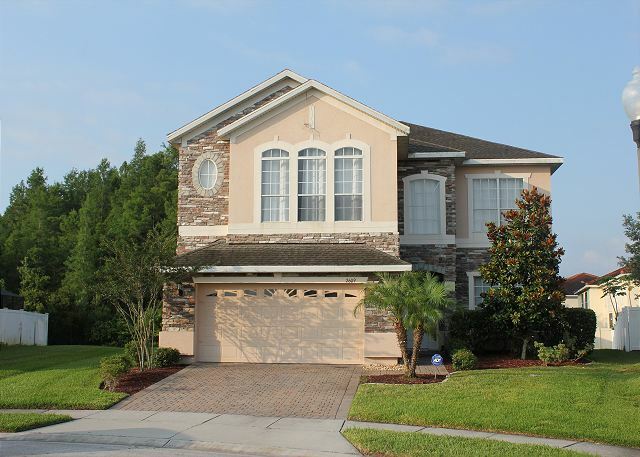 This house is perfectly located if you are in town playing USTA or going to Disney! Dear Shaner, thank you for an excellent review score. Glad you enjoyed this wonderful home and we look forward to welcoming you again in the future! This beautiful home has everything and more a family needs on a fun, laid back, relaxing vacation. The amenities were outstanding. My family (3 little girls, husband, and I) enjoyed coming home from a long day exploring to take a nice swim in the beautiful private pool. 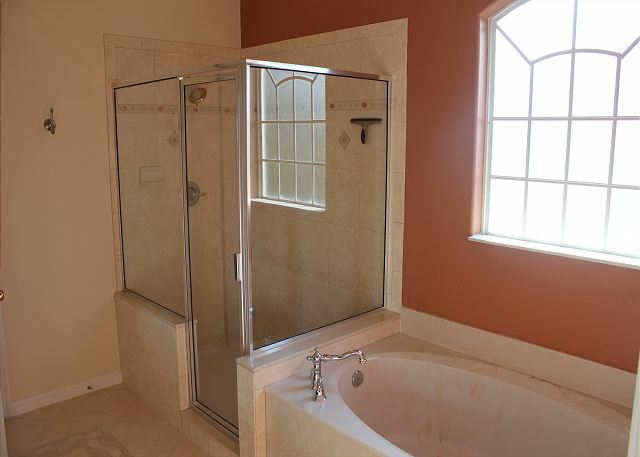 This property has plenty of space for everyone to have their private get away time if needed. 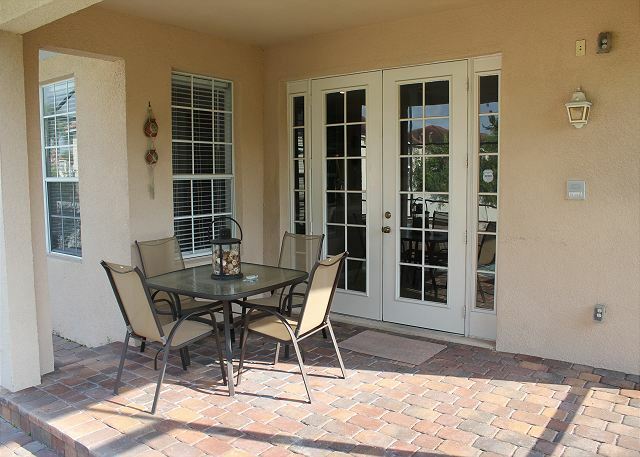 It is settled in an excellent location, very close to airport, Disney World Theme Parks, Sea World, and many more. Very easy to navigate to bypass toll ways, which is a bonus for it can get costly traveling that route. Will definitely be returning visitors to this home! Hi Brianne, thank you for an excellent review! Glad you enjoyed your stay at this great home and we look forward to welcoming you again in the future! Baseboards and walls and return cents very dirty. Some Spring Cleaning would do the trick! Beautiful home in general! Thank you for the stay! Kelly, thank you for your review. We appreciate your feedback and look forward to welcoming you the next time you visit the Central Florida area!! This was a wonderful house we enjoyed staying in! 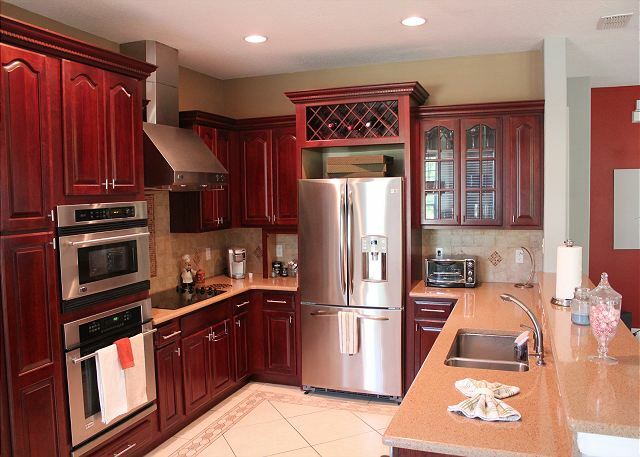 It is very spacious with a nice pool and a perfect kitchen with everything in it. The location of the house is very nice too, closeby everything like the parks, shops and restaurants. Aryan, thank you so much for your great review. Glad you enjoyed this wonderful vacation home with a private pool. We look forward to seeing you again next time! The vacation home was amazing! It was well kept and beautiful inside and out. I would definitely recommend it to family and friends. It's close to the gas station, supermarket and 10 min from Walmart. 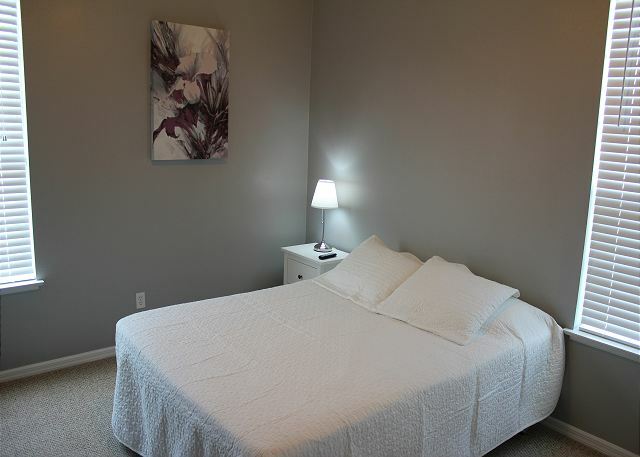 It's also close to the airport (14 min) and close to parks. The only thing I found wrong was the pool did not have a heating option. I wanted to heat it the first couple of days we were there because the temperature was only in the 60's- 70's so it was a little cold but once the weather warmed up the pool was fine. Tiffany, thank you for a wonderful review. Glad you enjoyed your stay at this Beautiful Vacation Home! Please come back and see us next time you visit the area. We loved the house. It was clean and had tons of room. The tub in the master bath leaked on to the floor as well as the other upstairs shower. Which happens but just wanted you to know. The shade in tbe formal dinningroom fell apart when I tried to use. The pics also made us believe we had a hottub. Other than this small stuff. We had a great stay and plan on booking for sure in the furture! Dear Marci, thank you for an excellent review and feedback. Glad you enjoyed this wonderful home and we look forward to welcoming you again in the future! The house was well located to amenities and in a gated community. The house was clean and had a lot of room to spread out and relax. There were a few burnt out light bulbs, beds were a little uncomfortable and pool had some cracked tiles. Even with those minor deficiencies, we would definitely stay there again! Hi Michael, thank you for the great review and your feedback. We look forward to seeing you again! I have to say we absolutely loved this home, it was gorgeous and very clean. - air conditioner was locked and wouldn't go below 72. It was really hot our second day and we had to go for a drive cause the air conditioner was locked and it was very warm in the house. Which honestly was not a big deal. -you have a serious Ant problem in the back. They are everywhere out back by the pool which made it hard to go out and relax by the pool, they also bit so I couldn't let my son out of my arms. The house it self was gorgous and clean when we arrived which was a win in our books. We loved everything about this house (besides the ant problem outside by the pool), it was comfortable and felt like home. Hi Robyn, thank you very much for your feedback and great review. Sorry to hear that you had an ant problem in the pool area. In the event that something like this would occur again, please call us so we can have the pest control take care of the ant issue. We hope we may welcome you back next time you visit the area! Hi John, thank you for a great review! Glad you enjoyed your stay at this vacation home. We look forward to welcoming you again in the future! The house was beautiful and we all enjoyed the comforts of your home. The kids absolutely loved the upstairs entertainment area and the pool. Lot of space, nice pool, air-conditioned, high-speed wi-fi, clean and silence. Just some of the word that describe this amazing vacation-home. If we were going to Orlando we would rent it again. Thank you Christine for an excellent review. Glad you enjoyed this wonderful vacation home and we look forward to welcoming you again in the future! House was clean and pool was nice. Would have been great to have a pool heater, but our weather was nice, so it didn't matter. Everything was very well run and was exactly as advertised. Loved that it was close to the highway (although it was a toll highway) because it greatly reduced travel time to all area attractions. Overall enjoyable stay in a nice house. Thank you Steven for a great review. Glad you enjoyed this wonderful home and we look forward to welcoming you again the next time you visit Central Florida! Thomas, thank you for a great review. We are happy you enjoyed this home. We look forward to welcoming you again in the future. I would like to start off by saying this home is absolutely gorgeous and I would definitely stay here again but there were a few issues. The mattresses weren't the most comfortable but that isn't really a big deal. The hall bathroom upstairs had a urine smell and the tub was a little dirty. My kids were looking forward to using the Playstation but when we arrived it wasn't working. I called to report the issue after hours and I received a call the very next morning acknowledging my phone call which was great. Someone came to pick up the machine while we were out but it was not replaced during our stay and I did not get a follow up phone call regarding the status of the machine. Since it's advertised as an amenity being provided in the home and my kids were looking forward to it, it would have been nice to have the broken machine replaced. My last and final issue with the home was the most disappointing. There were little spider-like bugs in the home. I'm no Entomologist so I don't know exactly what they were but they were very tiny and I would see them crawling on me and around the kitchen. When we took out the trash there were hundreds of them under the lid of the trash can in the garage. I would find myself scratching all night while in bed but I didn't see anything in the bed itself so perhaps that was all psychological but I definitely saw them on my skin while I was downstairs. I feel bad about reporting the negatives of this beautiful home and want to reiterate that I told family and friends about the home and plan to stay here again in the future but I felt it necessary to share my thoughts - both good and bad. Hi Lakisha, thank you for your review and feedback. Sorry about the Playstation not working. Unfortunately, the new one could not be delivered before your departure day. Now, a fews days later, a brand new one, was delivered to the home. As far as the bugs and dirty bath tub a quick call to the office and we would of had the issues taken care of. Glad you enjoyed the house and everything else that Central Florida has to offer! The house had everything we needed. 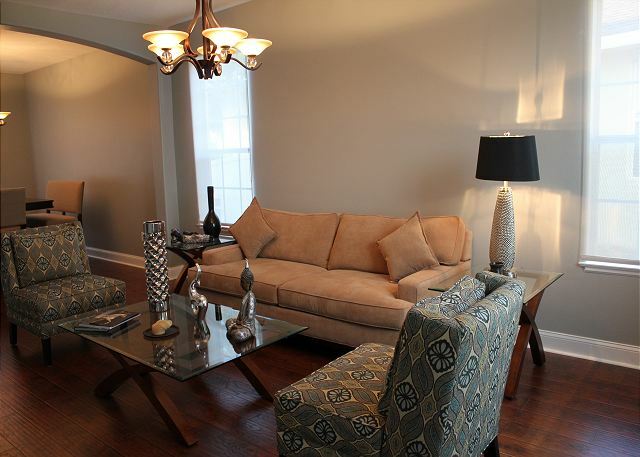 Spacious, equipped...a great homey experience. WIll use Excellent Vacation Homes again. Kelly, thank you for an excellent review. We are happy that you enjoyed this wonderful vacation home and celebrated your honeymoon. We look forward to welcoming you again in the future! Everything about our week-long stay was great. There is plenty of space for 8 adults. The house is very clean, has lots of amenities, and is in a very nice/safe neighborhood with easy access to the highway. If we ever came back to Orlando I would strongly consider staying here again. Nathan, thank you for an all excellent review. We are happy you enjoyed this wonderful home and look forward to welcoming you again in the future!! Well kept home, family said they would stay again in a heart beat. They LOVED the sleep number bed in the master. House was very nice. Wish pool was heated. Would have paid fee to heat it. Hi Maria, thank you for a great review. 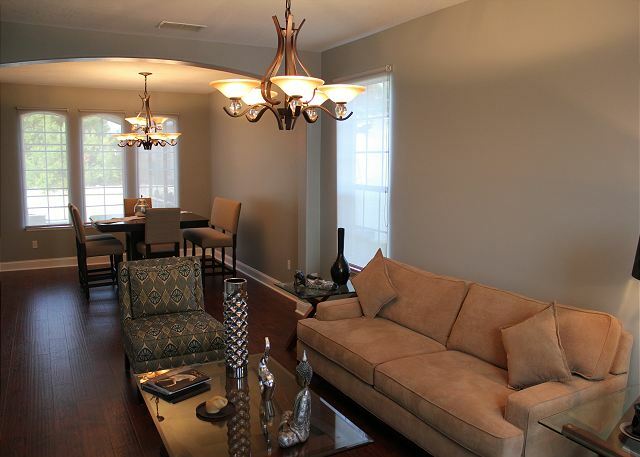 We are happy you enjoyed this wonderful home and everything else the area has to offer. We look forward to welcoming you again in the future! My family and another family (10 people total) were able to stay here comfortably with no problem! The space was more than adequate, the accommodations and amenities were more than expected (loved the pool and speaker system throughout the house) and the price was so reasonable others were trying to find out where we found it. The only issue we had was circulation of air. Since the book told us we couldn't turn it past 75, it took no time to get warm in the summer and was very hard to bring down. Other than that, we would definitely recommend this to anyone looking to rent. Thaddaeus, thank you for an excellent review. We are happy to read you enjoyed your stay and we look forward to welcoming you again in the future! The house exceeded our expectations. It was clean and very comfortable. The communication from Exxellent Vacation Homes was very clear and helpful. We will gladly rent from this company again, and would love to return to this house. The kids loved the pool and how much space they had to relax after a long day in the parks that were a 20 minute drive away. Publix is less than a minute to drive to which was super convenient. Jennifer, thank you for a great review score. We look forward to welcoming you again in the future! Beds are small and a little uncomfortable, but that is the only negative. The house was clean and well maintained. We discovered a leak and informed the office. Over all we enjoyed our stay. Hi Stephen, thank you so much for your great review. Thank you for letting us know about the leak, we got the plumber out the same day to take care of it. Glad you enjoyed this wonderful vacation home with a private pool. We look forward to seeing you again next time! It was one of the best places me and my friends had stayed at, we fell in love with the place, the cooking utensils and sofas were great. My partner did have mystery bites in the morning from the bed (I had only a few) although we checked the bed and din't find anything (I also washed the sheets just in case) the gaming system was great, although we had to buy our own batteries since there was many missing or they where old. On the plus side the stocked bar helped out greatly the pool was nice and clean , although it was cold but we got used to it. Hello Adrian, thank you for this great review. Glad you enjoyed your stay at this vacation Home! Please come back and see us next time you visit Central Florida. We look forward to welcoming you again! The vacation home was beautiful and in a great area. We really enjoyed the pool. Also, it was easy to access and find. The only issues we had were we noticed a lot of things weren't working properly. The toilet on the main floor seems like it would be an easy fix. The lights in the pool didn't work. The cold water faucet in the master bedroom tub didn't work. Most of the ceiling fans didn't work. The lights in the master bedroom could probably be fixed. There was a rip in one of the screens around the pool, which flapped in the wind. A regular toaster would have been nice also, but we got by with the toaster oven. The home was not immaculate, but it was clean. So, the property could use a little attention, other than that everything was good and it was quite hassle-free. Hi Laura, thank you for your review and feedback. Next time anything comes up during your stay, simply call us as we are available 24/7 to attend to possible concerns. Thanks again and we look forward to welcoming you in the future! Thank you Jay for a great review. Glad you enjoyed this wonderful home and we look forward to welcoming you again the next time you visit Central Florida!! It was a beautiful home, very spacious, very comfortable. We weren't very happy about finding the bed sheets to be dirty. They had drool stains and you can tell they had been used. We washed them, but they should have been clean when we got there. Specially when we paid for a cleaning fee. There was a binder with the "rules and regulations" that had misleading information. Information such as check-out time. It had 2 different hours. 10 am and 11 am. If I wouldn't have called the main office number, I would have been surprised the next day if I had not been ready for check-out. In general, it was a good stay, but very disappointed about the dirty sheets. There's a reason why we pay for a cleaning fee. Hi Bryan, thank you for your review. During your stay I wish you would of called us about the sheets being dirty (I would of had the cleaner change them out for you). Overall. I'm glad you enjoyed this wonderful vacation home and we look forward to welcoming you again! It was wonderful everyone was very helpful, I will definitely be looking into staying here again! Omar, thank you for an excellent review. We are happy to read you enjoyed your stay and we look forward to welcoming you again in the future!! We really enjoyed our stay at the property. 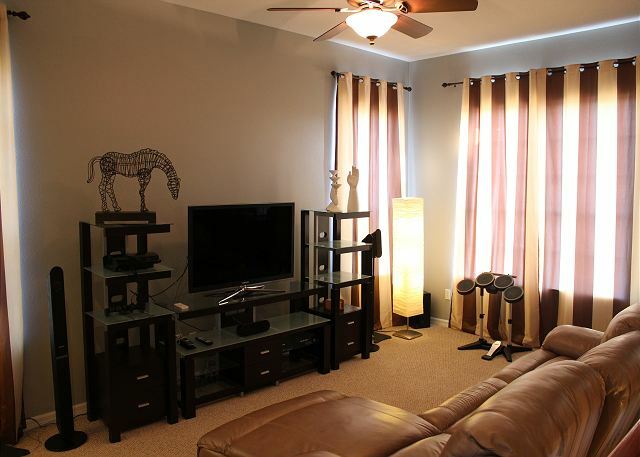 I was extremely impressed with the property and love the amenities such as pool, PlayStation,etc. The property was the best value for our stay with 10+ relatives. Thanks again. Genova,thank you for a great review! Glad you enjoyed your stay at this excellent vacation home located in a quiet neighborhood with a private pool. We look forward to welcoming you again in the future! It's in a great location and it is a beautiful home. We enjoyed it very much as it was almost perfect. However, we gave lower scores for maintenance. The property was definitely clean BUT, there was a foul odor throughout the entire home, which turned out to be the trash cans in the garage. Management sent a technician out who cleansed and sanitized the trash cans but the damage was already done for us. This was the only major thing wrong, which took 3 days of our stay away because it was unbearable for us and the family. Sandra, thank you very much for your review. Please accept our apologies for the inconvenience from the odor of the garbage cans. We look forward to welcoming you again in the future! Secured place, comfortable, close shopping and close to everything! Larissa, thank you for an excellent review score. We look forward to welcoming you again in the future! Could be really nice, but is not being maintained. Minimal furnishings, beds are worn out. Hi Daniel, thank you for leaving us a review for your stay. Sorry to hear you didn't feel the home is very well furnished; based on the many great reviews for this home we would think many of our guests feel different about that, but one's preference for decor understandably varies from person to person. We were a bit surprised to read about the beds allegedly being worn out, as all of them, including mattresses, are less than 2 years old. Maybe you felt the master mattress was not comfortable, not realizing it is a sleep number mattress (firmness adjustable with the remote typically placed on the nightstand)? We do hope we may welcome you back anytime you visit Central Florida again. Nice house, lots of space. Unfortunately we came in to a very rancid odor. Apparently the freezer went bad and we were unable to enjoy the space the first day/night because the smell was so bad throughout the whole house. One of the guests even got sick and threw up. I called the contact number and someone came out quickly to rectify the problem. Just wish someone would have caught the problem before we got there. Hi David, thank you for a good review and your feedback! Glad you enjoyed your stay and we look forward to welcoming you again in the future! Absolutely Excellent, perfect pool, plenty of room,had a wonderful time. Dear Cody, thank you for an excellent review. We look forward to welcoming you again in the future! 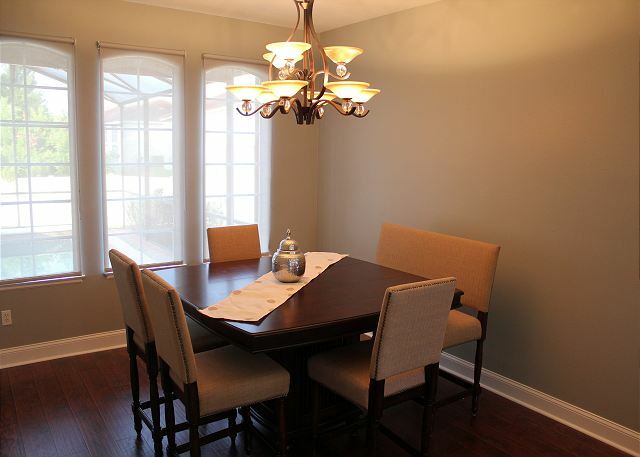 The home overall was real nice, very clean, you have more that what you need at this home. Thank you very nice place. Thank you Pedro for an excellent review. Glad you enjoyed this wonderful home and we look forward to welcoming you again the next time you visit Central Florida! The house was everything we where hoping for it to be and more.. The pool was great.the kids loved that there was a Play station. Gated comunity, everything is near by . This home by far was the best we ever stayed in. And will Definantly try and stay there again on my next trip. Hi Akram, thank you for an excellent review. Glad you enjoyed this wonderful vacation home and we look forward to welcoming you again ! This was a beautiful house in a quiet and garded. All Inventory was luxery. This was the best vacation home we ever had. Dear John, Thank you for an excellent review and we look forward to welcoming you again the next time you visit Central Florida! I WENT WITH MY FAMILY AND IT WAS PERFECT FOR US... VERY COMFORTABLE. Tabatha, thank you for an excellent review score. Glad you enjoyed this wonderful vacation home and we look forward to welcoming you again in the future. Great home overall.. beautiful location, clean, big , photos like...impressive furniture and gadgets. However we did find 2 big issues during our stay; #1 the pool spa which looked beautiful on the pictures and one of the main reasons we picked the home, was not working...we were never warned about it. Complaint #2 was the AC, minimum temp we were able to set was 75, at the time we were all gathered at a same place forninstance the dinning table, it was really hot and uncomfortable, we felt total discomfort with this standard temperature during the morning and noon hours. Putting aside the spa and the AC the house itself was a 5 star no doubts, we really enjoyed our stay and will be planning for a soon rental THanks! Overall it was a great experience. Good location. 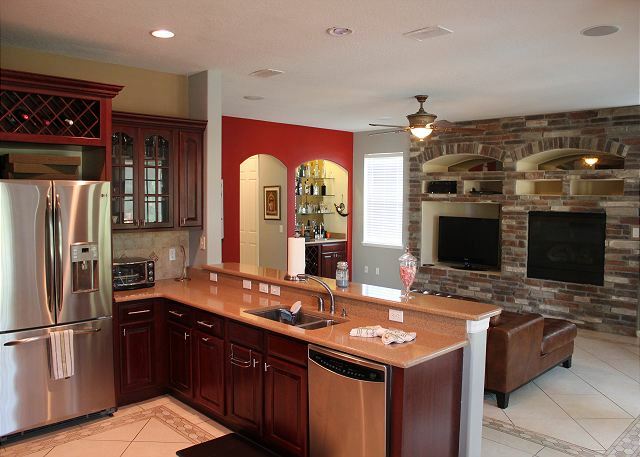 Great kitchen and entertaining space. Lots of technology but need instructions as we lost cable signal a few times. Home alarm system frustrating. Put recycling out on the right day but it didn't get picked up. Nice lanai and pool but it needs to be heated and have a solar cover. Limited outdoor furniture. Shower in master ensuite slow to drain. Robert, thank you for a great review. A quick call to the office and we will take care of any concerns you have during your stay. We are glad you enjoyed your visit with us and we look forward to welcoming you again in the future. I rented a home close to the airport and close to my waterski lake when I hosted 10 women for a waterski getaway. The 6 ladies who stayed in the rental we're very happy with the location & size. This home is perfectly finished to look very expensive. We fed 10 in the home one evening very comfortably. The only negative is there weren't enough garbage bags for the 4 days of eating I'm house. Whitney, thank you for an excellent review! Our vacation homes are self-catering. Glad you enjoyed your stay at this great home located in a quiet neighborhood. We look forward to welcoming you again in the future! I was more than pleased with the house!! Beautiful property and very clean and organized. The neighborhood was quiet and very nice. I would give it 5 stars ( more of there is any such thing :) great place!!! Edom, thank you for an excellent review. We are happy to read you enjoyed your stay and we look forward to welcoming you again in the future.